In case you guys were curious as to what I picked up from the NSALE here it is. As easy as it is to go crazy with this sale I like to remind myself to only get a few things that I REALLY want and will get tons of wear from. Here are my picks! 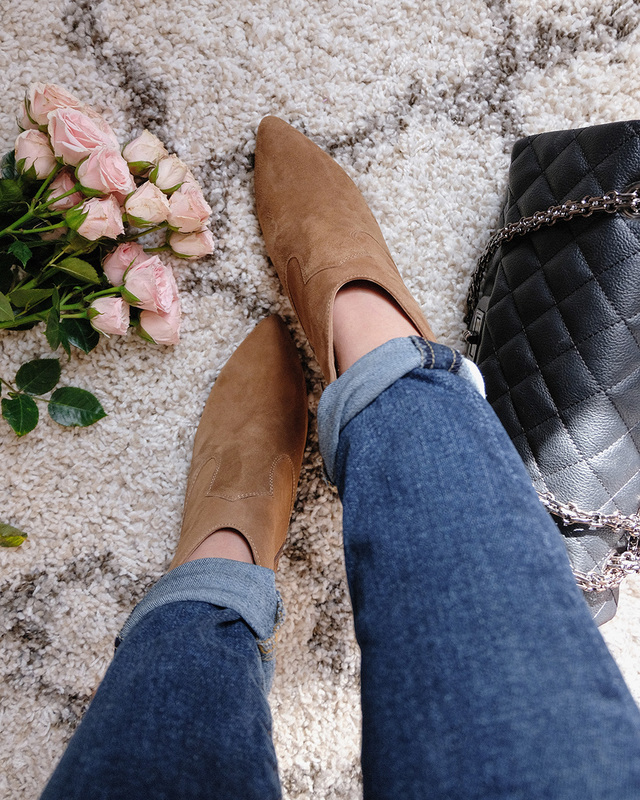 First up are these VINCE CAMUTO booties. They are so cute and I can't get enough of this color for accessories/shoes. They are great quality and are on sale for under $100. I recommend you go up a half size because they do run small since they have a pointed toe. Next is this textured stitch sweater from BP. I knew right away that I needed to get this sweater because it looked so comfy! When I got it in I wasn't disappointed, it's super soft and looks so cute on. Unfortunately, it's already sold out but it's possible that they'll restock. 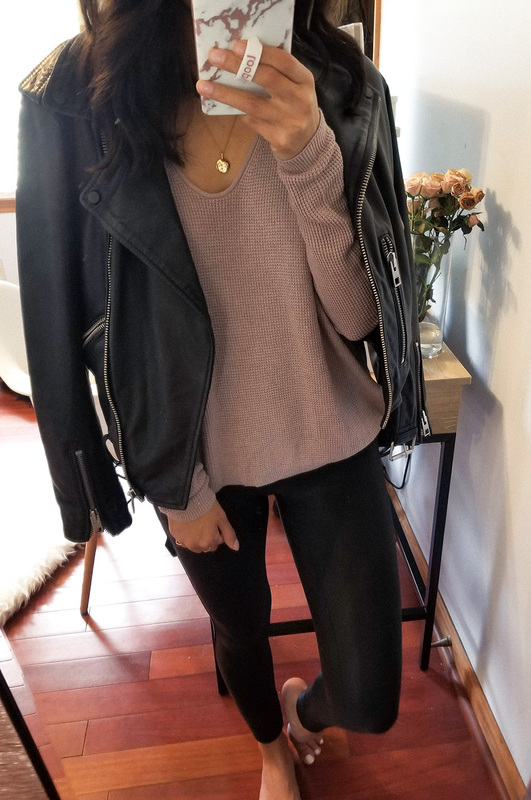 The leather jacket I'm wearing is not part of the sale but it's amazing if you're looking to invest in one! These SPANX leggings I bought last year and absolutely love them! If you need a legging you can dress up these are for you too! 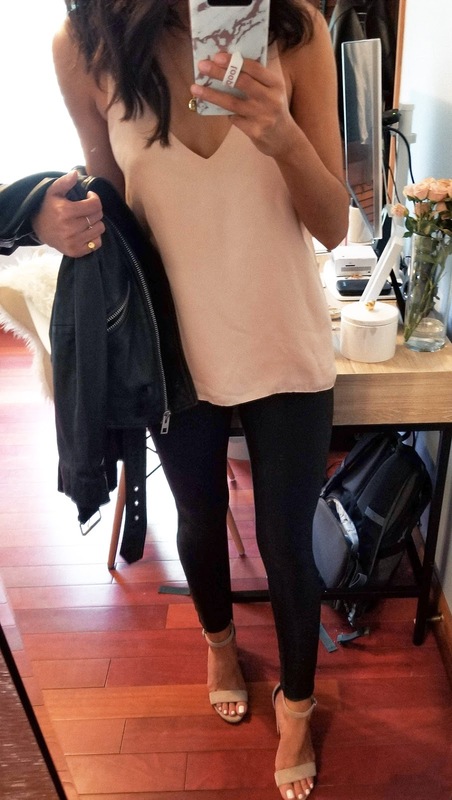 They're called the faux leather legging but I wouldn't suggest them if you're looking for a faux leather look because, in my opinion, they don't look like leather. It's more of a shiny look. They're super sturdy and durable, and it's 1 year later and they're still looking great. As you can see, leggings are a must have for me. I highly recommend these ZELLA high waist leggings to everyone, especially at the anniversary sale price. They are thick and such great quality. I get tons of questions about them whenever I wear them because they look that good. I've also read that they're comparable to Lululemon leggings, but I've never tried those so I can't say. Lastly, I picked up a curling iron from T3. I've heard NOTHING but good things about all their products and I've seen tons of girls with amazing hair swear by their curling irons so I gave in and got one for myself. This is the cheapest I've been able to find this curling iron so highly recommend you grab one too if you've been curious about T3. I'm going to do a full review on it to see if it's worth the hype soon! There are still a few more products that I missed out on and hoping they will get restocked, like these jeans from BLANKNYC and this LA MER set that I missed out on last year too. One more thing I want to mention before I go is that my favorite eyelash growth serum is part of the sale!! It's such a steal because 1, it actually works and 2, you're getting one tube free!